A large feeding hopper will be used to catch the soil slurry first. GN Solids use steep side angle walls so that wet and sticky soil falls to the bottom of the hopper easily. Across the top of the hopper, a bar grate to keep large, oversize material from entering the hopper and plugging the hopper. GN screw conveyor transports the soil from the bottom of the hopper to the Shale Shaker Screener. Screw conveyor should be the proper angle and length to empty the soil feed hopper and discharge on to the Shale Shaker Screener. GN Shale Shaker will remove gravel and stones and oversize debris. Different size screens will be assembled on the shaker. High pressure water spray nozzles are fixed on the shaker deck in order to wash the soil through the screens. The Shale Shaker is positioned on top of a mixing tank. Usually, GN Hi-G force shaker GNZS594 will be used to treat the slurry. Vibration motors are using USA martin or Italy OLI. The mixing tank should be approximately 7000 liters. It needs a robust, strong mixer. It needs steam coil piping in the interior of the tank to heat the soil slurry. Operating temperature is normally 70 C.
The Slurry Pump should be a centrifugal pump. 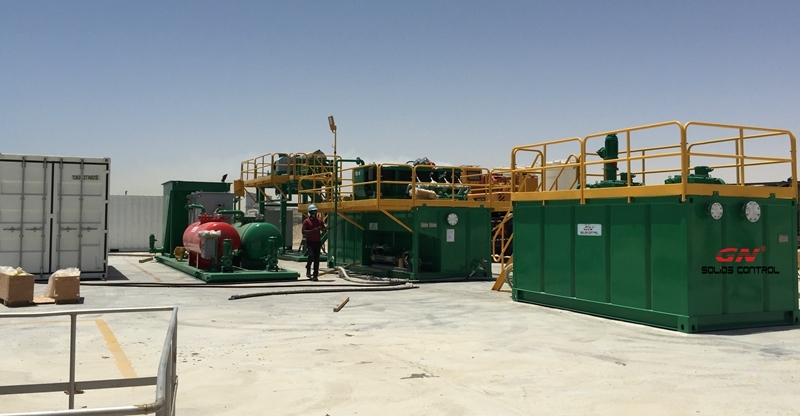 It will transfer the soil slurry from the mix tank to the following treating equipment. There are some other equipment will be used. If you want to learn more, welcome to connect with GN Solids Control.